Have you seen this movie where frustrated Hugh Grant says repeatedly "bugger, bugger, bugger", trying to keep his voice low, when he is in obvious need of another word? That's exactly how I felt when I tried to finish a tree of life pendant from my "for dismantling" box. It didn't work the first time and I wanted to give it a second chance for the January challenge on Art Elements, set by Lindsay Starr. Well, I hope nobody misses my tree of life pendants because I'm not going to make any ever. But the dark blue lentil tagua bead was perfect for this Blue Moon and Starry Night necklace. Good old wire weaving saved my... project! "Дървото на живота" е толкова популярен модел, че нямах никакво намерение да го правя. Въпреки това, опитах веднъж и не се получи. Реших да му дам втори шанс за януарското предизвикателство на Art Elements, предложено от Линдзи Стар. Е, надявам се никой да не забележи липсата на моите висулки от този тип, защото няма да има такива. Затова пък тъмносиньото мънисто тагуа от разглобеното вече дърво се оказа идеално за колие "Синя луна и звездно небе". Did you read this post by Jennifer Cameron? This was so funny: "I have the desire to be able to draw" - it's about me, too :) Of all the imagery, related to the Moon, I picked up two night creatures - the wolf and owl. Here is the result of these tutorials (1, 2, 3 & 4) and daily practice. В тази публикация има един израз, който много точно ме описва и силно ме разсмя: "Иска ми се да можех да рисувам" :) От всички образи, свързани по един или друг начин с луната, избрах вълк и сова. Ето какво постигнах, следвайки тези урочета (1, 2, 3 & 4) и упражнявайки се всеки ден. I also made a sketch on my tablet software. It has some very useful tools like mirror drawing and resizing (when you realize there's no room for the body). But you also have to remember the tools, colors and sizes, etc. The interesting part was finding ways to recreate pencil effects with e-tools. Направих и една скица на таблета. Използвах някои полезни инструменти като огледален образ и промяна на размера (когато се усетиш, че няма място за тялото). Но също така трябва да помниш инструментите, цветовете и размерите. Беше ми интересно да търся начини да пресъздавам ефектите на молива със средствата на софтуера. This was a last minute creation - Flowers on the Moon. Really, I didn't even have the time to write a story about it. Or decide what it was going to be - a pendant, a brooch or a horizontal focal. I guess I have to make two more and try all options :) I included a beaded flower in the mosaic and came up with an interesting way to attach it that I will share with you some day. Това сътворих в последния момент - "Цветя на луната". Дори не ми остана време да напиша някаква история. Или пък да реша какво точно ще бъде - висулка, брошка или централен елемент от колие, разположен хоризонтално. В мозайката включих и оплетено от мъниста цветче - мисля, че начинът на закрепване е интересен и някой ден ще го споделя с вас. Rosantiа - you are here! Вие се намирате тук! Публикувано от bairozan в 21:06 ч.
Saraccino 31 януари 2019 г., 21:41 ч. Your necklace is beautiful and I love that you started drawing! But I have to say... your last minute creation is my favorite, I love it! Your flowers of the moon are stunning and I can't wait to see what the end result will be! bairozan 2 февруари 2019 г., 0:27 ч.
CraftyHope 31 януари 2019 г., 21:51 ч.
I hate that you had such a hard time with that tree of life pendant. But, what you did create is wonderful. I adore the blue tagua nut you used in the necklace. It pairs so well with the copper! And your drawings...you CAN draw. It's awesome! Both of your owls in particular catch my eye (I'm a fan of owls.) And, that beaded moon is simply FUN!! Can't wait for you to tell us all about that one, especially what it's become. Awesome job with the inspiration. bairozan 2 февруари 2019 г., 0:31 ч. Thank you, Hope! I'm not going to worry about the tree of life any more, I guess I just tried to not waste the supplies that went into it :) I am happy with my drawings, given that I couldn't even think about something like that just a couple of years ago. Yes, the beaded moon was fun to make and I'm eager to make even more! Caroline 31 януари 2019 г., 23:09 ч. Your wirework is beautiful and your sketches are looking fantastic, especially the digital one. I love to draw on my ipad! And I really love your last minute piece, it's a gorgeous combination of colours and texture. bairozan 2 февруари 2019 г., 0:35 ч. Thank you, Caroline! Frankly, I was afraid to even try sketching with real pencil and paper, the tablet felt safer. I love how different the owls are, even though based on the same tutorial :) I'm really proud of my last piece, too! Jennifer Cameron 31 януари 2019 г., 23:51 ч.
I'm so glad you started drawing. (shhh...I have not yet. Do not tell anyone!) I love your pieces, but your last minute one is stunning. I vote it becomes a brooch! Thanks for participating in our monthly challenge and reading our blog. I'm so happy to have you. bairozan 2 февруари 2019 г., 0:37 ч. Cat 1 февруари 2019 г., 0:46 ч. Flowers of the moon - that sounds like a wonderful story to be told. It is a wonderful piece! I also love the first necklace and the drawings, beautiful. bairozan 2 февруари 2019 г., 0:38 ч.
Lindsay 1 февруари 2019 г., 4:48 ч. Wire weaving! I can make good loops, but your moon pendant is so far beyond me, it's in orbit! I really appreciate you sharing your drawings too...slight teaser, but you might find next month's theme fun. And I do hope you will share what you decide to do with your flower moon mosaic. It's so happy and springy! Thank you for playing along with us! bairozan 2 февруари 2019 г., 0:41 ч.
Anita 1 февруари 2019 г., 15:09 ч. You're really good at drawing! I agree, the digital tools make it easy to not get discouraged and give up. Your wirework is gorgeous as always, and the necklace is beautiful. And as for Flowers on the Moon, I totally love it, and would love to see what you decide to turn it into! bairozan 2 февруари 2019 г., 0:52 ч. Thank you, Anita! I do hope for perseverance to pursue drawing with both digital and real life tools :) I'm so glad everybody likes this last piece, I was really exhilarated about it, too! Chic Chix and Champagne 1 февруари 2019 г., 15:16 ч.
Rosantia, I'm with the majority here about loving your last minute piece! So many delicious little components to feast the eyes on! The color of that bead in the necklace draws my eye in too. And your sketches? Awesome! Alysen. bairozan 4 февруари 2019 г., 10:52 ч.
SueBeads 1 февруари 2019 г., 18:16 ч.
I agree with Claire - love your necklace and I totally admire your drawing, as I can NOT draw! But I do love the flowers on the moon too! bairozan 2 февруари 2019 г., 0:57 ч. Thank you, Sue! I'll be 60 this year and didn't suspect I could draw anything until 2 years ago. I don't know if I will ever draw a sketch from my imagination but even being able to follow a tutorial makes me feel unbelievably good! Sarajo Wentling 1 февруари 2019 г., 22:54 ч. Your necklace is just lovely! That's a beautiful color combination. bairozan 4 февруари 2019 г., 10:03 ч. Thank you, Sarajo! That blue tagua bead looks like a real night sky, I was lucky to have it! Sarah 2 февруари 2019 г., 6:04 ч. Beautiful work! Your wire wrapping is exquisite. You created magical pieces that would be a joy to wear. And I love your drawings of the wolf and owl - perfect animals to enjoy the moon. bairozan 4 февруари 2019 г., 10:54 ч.
Divya N 2 февруари 2019 г., 10:26 ч.
bairozan 4 февруари 2019 г., 10:58 ч. Thank you, Divya! I feel the same way about my drawing but still think of it as practice. Oh, yes, it just wasn't meant to be - brilliant, I feel so much better now! Tammy Adams 2 февруари 2019 г., 19:13 ч. Everything is so wonderful. I love the wirework and the sketches and am especially impressed with the owl drawn on tablet. Nicely done. bairozan 4 февруари 2019 г., 11:00 ч. Thank you, Tammy! 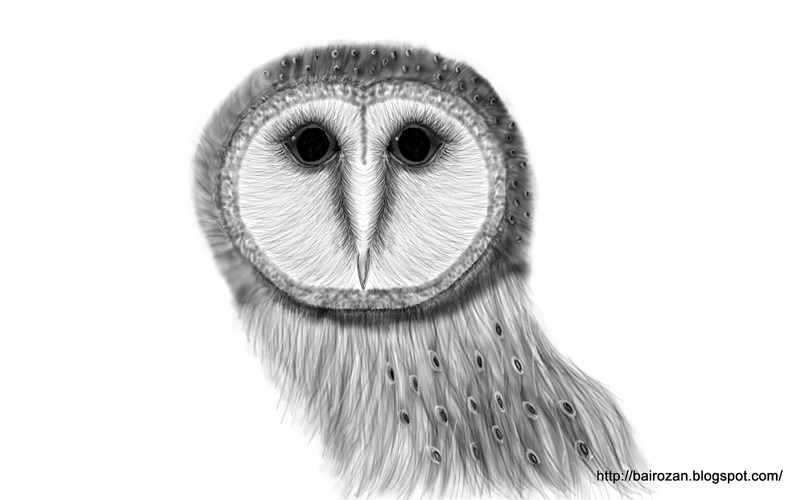 The owl on the tablet is completely different, isn't it! Just because I used the mirror tool and couldn't adjust the space between the eyes (it should be equal to two eyes) the little guy has a completely different look! Niky Sayers 3 февруари 2019 г., 10:50 ч. Your wire wrapping is really lovely and beautifully neat and so are your drawings! I never seem to be able to draw anything, its like a mental block that stops me before I start but I would love to learn too. bairozan 4 февруари 2019 г., 11:02 ч.
Laney 3 февруари 2019 г., 15:50 ч.
bairozan 4 февруари 2019 г., 11:06 ч.